18-03-2014 • Categories: Match!, New release, Search! Textkernel is presenting the new version of its semantic multi-database search software products Search! and Match!. In the previous release of Search! we introduced creating projects and saving results. In this new release we expanded this option, allowing you to tag results in multiple projects, share projects and search through them. A major new feature in Match! is the improved bi-directional matching from multiple job databases (and Jobfeed) to multiple cv databases. Read the highlights below, or register for one of the Search! & Match! (2014.1) webinars. In addition to retrieving information from your database, Textkernel now also enables sharing knowledge in your organisation with Search!. Textkernel offers recruiters or hiring managers the ability to save results in multiple projects while automatically giving them a tag. A tag is a label that can be given to a search result. By tagging results, the information in the database will become even more valuable and better searchable. 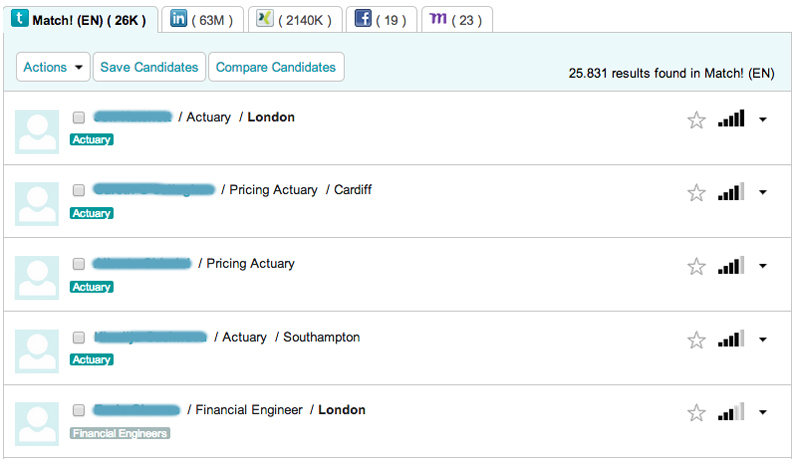 The tags are automatically visible in Search!, as the image below shows with the tag ‘Actuary’. You are not only able to tag results in your own database, but also results you found in external sources. This new feature supports active sourcing and can help you expand your talent pool. The tags or projects can be shared with other users. Per result you can see your own tags and tags from others that have been shared with you (such as ‘Financial Engineers’ as shown in the image). This knowledge sharing will ensure that your organisation can work more effectively. The tags can also be used as search criteria. Use one or multiple tags in your search, or exclude results with a certain tag. For example: when your organisation is recruiting for specific positions, such as actuaries, you can tag interesting profiles in your database or external sources and share them with colleagues. This way you can effectively create a meaningful talent pool. This functionality is available with Textkernel’s product Match!. Another important new feature is the expanded bi-directional matching, by connecting Textkernel’s job mining tool Jobfeed* to Match!. This helps to better and faster bring supply and demand in the labour market together. Jobfeed collects and structures all online jobs and makes them searchable. With the addition of Jobfeed to Match!, users can match a profile to all online jobs in the Netherlands, Germany and France (with Jobfeed*), enabling you to faster find that relevant job for your candidate, client or (redundant) employee. On the other hand you are able to match a job (from your database or from Jobfeed) to all profiles (from your databases, job boards or social media. This opportunity to match both ways with all jobs, increases the chance and speed to make that relevant match. This technical modification allows you to easily browse through CVs in your Search! interface. When you click on ‘show CV’ this opens a pop up screen (lightbox). From this screen you can easily click through to the next or previous candidate, without having to open and close each result. From the pop up, you can also select CVs for further action (such as saving it to a project, or comparing candidates). In the application, besides pasting a link, you can now also upload or drag and drop a file (CV or job) that you want to match to your database. Textkernel’s software will use the text to make a search and show you the most relevant results in your database(s). Textkernel made an API and framework that allows results to be de-duplicated in Sourcebox. This is now available for Sourcebox and Bullhorn. The framework allows for easy development of APIs for other software. Improved connection of multiple internal CV databases to Search! Textkernel made improvements and offers support for connecting multiple internal CV databases to Search!, such as your employee database and talent pools. Textkernel offers a new Excel export style with a vertical layout (exchange of rows and columns). This makes the comparison of candidates or jobs more easy. Textkernel added this feature to send field updates with the API. Sending only the changes made to certain fields – such as ‘candidate availability’ – in stead of the whole document, will improve the efficiency of the Search! indexing API. Fill out the contact form for more information on these new features or products, or register for one of the webinars.